Rajendra Pulley half a century-experienced in Gear industry has created benchmark with its commitment, sincerity, transparency, dexterity and dedication. Wide Range of Gears :- Gears are used to alter the speed and direction of the of the source. They are part of the rotating machines having teeth and cogs which work in coordination with other parts. Our Company are fully equipped with all types of gears which are used in many industries. 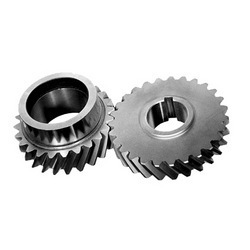 Providing these gears at affordable rates, we are well known manufacturer of auto gear exporter. 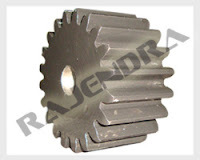 Rajendra Pulley Manufacture varied range of the Spur Gears which is manufactured from high grade quality of raw material. These components are widely used in the engineering industries. Spur Gear are made from different metals & alloys as well as Our Company offer Spur Gears in various specifications of sizes and shapes. Customization provision is also offered in these gears as it can be personalized according to client requirement. Spur gears or straight-cut gears are the simplest type of gear. They consist of a cylinder or disk with the teeth projecting radially, and although they are not straight-sided in form, the edge of each tooth is straight and aligned parallel to the axis of rotation. Spur gears can be meshed together correctly only if they are fitted to parallel shafts. Rajendra Pulley manufacturing of the Helical Gears which is effectively used in the food processing industries. These gears when used in the parallel shafts are like the spur gears. Where velocities exceed 1000 feet per minute, helical gears provide a stronger, smoother running gear train. This stock gearing is provided in 45° helix angle. End Thrust is developed by helical gears, but this may be overcome through the use of thrust washers or other suitable types of thrust bearings. The shafts which are on the right angles are frequently known as the spiral gears. This application has one point connection with the teeth thus it is not suitable for transmitting any appreciable amount of horsepower. Helical Gears offer a refinement over spur gears. The leading edges of the teeth are not parallel to the axis of rotation, but are set at an angle. Since the gear is curved, this angling causes the tooth shape to be a segment of a helix. Helical gears can be meshed in a parallel or crossed orientations. The former refers to when the shafts are parallel to each other; this is the most common orientation. In the latter, the shafts are non-parallel, and in this configuration are sometimes known as "skew gears". Quite commonly Helical Gears are used with the helix angle of one having the negative of the helix angle of the other; such a pair might also be referred to as having a right-handed helix and a left-handed helix of equal angles. The two equal but opposite angles add to zero: the angle between shafts is zero – that is, the shafts are parallel. Where the sum or the difference (as described in the equations above) is not zero the shafts are crossed. For shafts crossed at right angles the helix angles are of the same hand because they must add to 90 degrees. 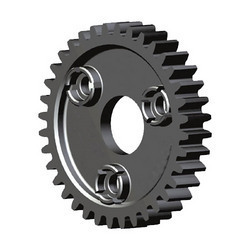 Double helical gears is also called as Herringbone Gear, overcome the problem of axial thrust presented by "single" helical gears by having two sets of teeth that are set in a V shape. Each gear in a double helical gear can be thought of as two standard mirror image helical gears stacked. This cancels out the thrust since each half of the gear thrusts in the opposite direction. Double helical gears are more difficult to manufacture due to their more complicated shape. A Bevel Gear Manufacturer India. is shaped like a right circular cone with most of its tip cut off. When two Bevel Gears mesh their imaginary vertices must occupy the same point. Their shaft axes also intersect at this point, forming an arbitrary non-straight angle between the shafts. The angle between the shafts can be anything except zero or 180 degrees. Bevel gears with equal numbers of teeth and shaft axes at 90 degrees are called miter gears. The teeth of a bevel gear may be straight-cut as with spur gears, or they may be cut in a variety of other shapes. Spiral bevel gear teeth are curved along the tooth's length and set at an angle, analogously to the way helical gear teeth are set at an angle compared to spur gear teeth. Zerol bevel gears have teeth which are curved along their length, but not angled. Spiral bevel gears have the same advantages and disadvantages relative to their straight-cut cousins as helical gears do to spur gears. Straight bevel gears are generally used only at speeds below 5 m/s (1000 ft/min), or, for small gears. India is a growing country for all kind of Industrial Machines, We are doing all kind of industrial application where Gears is our USP from passed 60 years. We are leading Gears Manufacturers in India, We are specialized in all type of Gears for almost all type of industrial application like industrial gears,marine gears,defence gears,power gears etc. There are so many Gears Manufacturers in all over India where We are supplying huge quantity gears in all over world from India. Hello, I love reading through your blog, I wanted to leave a little comment to support you and wish you a good continuation. Wish you best of luck for all your best efforts. gear coupling manufacturers in India, gear coupling suppliers. Hello, I love reading through your blog, I wanted to leave a little comment to support you and wish you a good continuation. Wish you best of luck for all your best efforts. gear coupling manufacturers in India , gear coupling suppliers . It is Nice Post to get details of your services. Gearbox, Gears, Machine Components etc. Thanks for your ideas. You can also find the details on Drive Parts Direct, at the Timing Belts Imperial. Drive Parts Direct aims to provide you with a convenient “one stop shop” for all your Power Transmission component requirements.